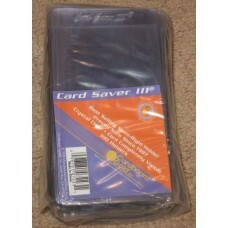 Pack of 100 Card Saver III Tall Semi Rigid Trading Card Holders. Each holds one tall sport or nonsport trading card such as GameDay, Widevision, or Tall Boy size. This is a semi-rigid product that is not as hard as a topload holder, but not soft like a poly sleeve. Clear on both sides - opens on short side. Do you have any questions about Pack of 100 CBG Card Saver III Semi Rigid Tall Card Holders?